African Black Soap is one of the gentlest and most skin-nourishing cleansing products you can find— and it’s not new or particularly fancy. 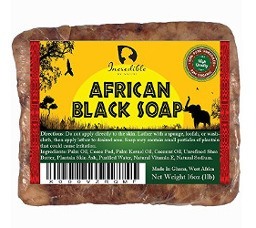 This soap, often just called ‘Black Soap’, has been traditionally made in Western Africa for hundreds of years. The soap is made from a shea butter base, usually with other plant oils added, such as coconut oil and palm kernel oil. The black color of the soap, which is really a dark brown, comes from the dried and roasted ashes of cocoa pods and plantain leaves. This ash is mixed into the shea butter base to form the soap. Sometimes other items are roasted and added as ash as well, although they aren’t necessary for the soap to be authentic. Shea bark and palm tree leaves are other popular ingredients. One of the main ingredients in this type of soap is shea butter. Shea butter is probably the greatest skin product available and is one of the power ingredients in this soap. The rich oil is so smooth and moisturizing, but is also completely non-comedogenic, meaning it won’t clog pores. Shea butter is loaded with vitamins, especially vitamins A, E, and F. These vitamins help your body to fade fine lines, as well as to heal and minimize scarring. They also boost collagen production so your skin is firmer and healthier. The cinnamic acid in shea butter also reduces inflammation and calms irritations such as bites and scratches. In addition to the shea butter base, the ash in African Black Soap has some of it’s own great properties. Plantain peels are high in antioxidants and healthy acids. Cocoa pods are also high in antioxidants, as well as being anti-inflammatory and soothing to skin. The ash not only works to saponify the oils in the soap, but it’s also slightly abrasive, adding a gentle exfoliating quality to the final product when used directly against skin. Some people find this to be a little too coarse, in which case the soap easily breaks apart and can either be dissolved in water to form a liquid soap, or just lathered into something else so that the fine grit is less abrasive. African Black Soap is also a great cleanser for people with skin problems. Psoriasis, eczema, acne, and rosacea are just a few. The soap is naturally antibacterial and anti-inflammatory, so it cleans away dirt and grime while also dispelling blemish-causing bacteria. The anti-inflammatory ash and soothing base help skin to regulate the correct turnover of skin cells— increasing the speed when healing is necessary and slowing it down in the case of overactive skin conditions. This soap is ideal for children because it is non-toxic and free of the toxins that fill most conventional soaps. It also makes a great lather, which kids are sure to appreciate. An authentic African Black Soap should look very chunky, with alternating sections of light and dark, not one smooth color. It should have a slightly rough consistency from the pulverized ash. Authentic Black African Soap forms a really abundant lather and dissolves very easily, meaning you can easily make it into a liquid soap or a simple bubble bath. To use African Black Soap, use a sponge or loufah to form a generous lather. You can use the soap as an all purpose body scrub and shampoo, although the shampoo may need to be followed up by an Apple Cider Vinegar rinse to restore the correct pH of your hair. If you prefer to use it directly against your skin, work off a small amount of soap from the brick— about the size of a grape. Gently work this in your hands with some water until it is creamy and malleable and then wash over your entire body with your hands. The soap may scrape your skin a little because of the ash, so use your discretion for what works for you. Follow up with a raw shea butter moisturizer for a truly soothing and radiant glow. You can buy African Black Soap pre-liquefied, but we don’t recommend those products. Most of them don’t seem to have the same healing benefits of the bar form of the soap and are not authentic or traditional. They are also more likely to have gone through more chemical processes that have changed the soap from its original (if it ever was) form. It is better to buy this soap in the solid form, which is a much better value anyway, and then simple let it dissolve in water on its own for a liquid version. It dissolves fairly easily and will yield a better result. Incredible by Nature’s Black Soap is made in Ghana, the traditional home of African Black Soap. It comes in a formidable 1 pound block, which you will probably want to chop up into smaller pieces for use. You can wrap the remainder of the block in plastic and store it in a cupboard while you use the individual slices. This soap is great for fading stubborn scars from pregnancy, acne, or almost anything else! It is also a great facial cleanser that won’t leave your skin feeling dried out. This bar is also vegan friendly and fair trade. Shea Moisture makes a great product at an affordable price. 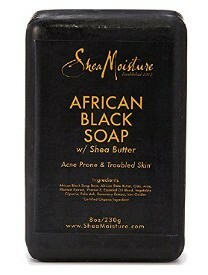 Shea Moisture African Black Soap is sold in packs of four, and each 8-ounce bar is individually packaged. So for a little over $16, these four bars will last you a long time. The product is made with unrefined, organic shea butter, palm kernel oil, oats, plantain extract, palm ash, aloe vera, rosemary extract, and Vitamin E. This bar has a very pleasant, earthy scent, and is also fair trade. The whole process is organic. This authentic, traditional soap is a great idea for whatever your skin needs. It is completely free from the horrible chemicals that have infiltrated so many of our skin care products and is effective to clean and bring back a healthy glow to your skin. Whether you are using it for wrinkle and scar removal, or just a safe bubble bath for your kids, this soap is sure to satisfy.